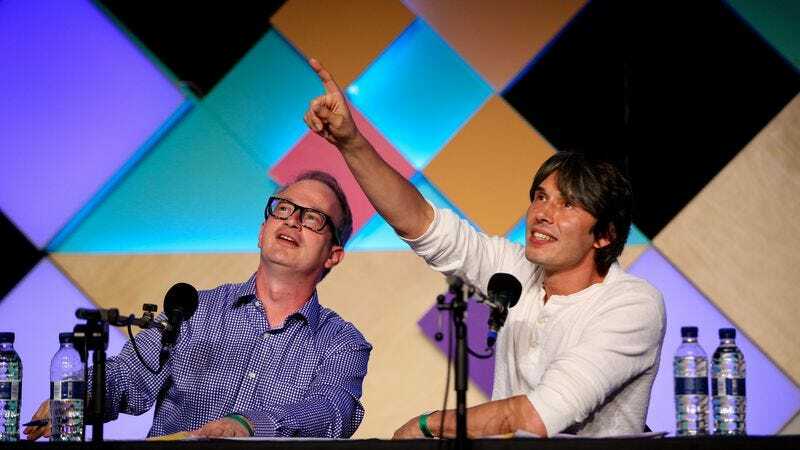 The fans: Comedian Robin Ince and pop-star/physicist Brian Cox have helmed the popular BBC4 radio show The Infinite Monkey Cage since 2009. Mixing comedy and science with ease, Monkey Cage has included a diverse guest list, including Alan Moore, Stephen Fry, and Neil DeGrasse Tyson, and recent topics have ranged from biting ants to the complicated relationship between science and war. The duo is currently touring the U.S. to record Infinite Monkey Cage episodes, and we caught up with them to talk about one of their greatest influences, astronomist Carl Sagan, who hosted the original Cosmos program in 1980 and was a champion of popularizing science. Despite picking such a heady topic for their Fan Up, Ince and Cox bring all the charm of their podcast to this discussion with The A.V. Club about creationism, an extinction theory involving constipated dinosaurs, the lasting imagination and skepticism of Carl Sagan—and why science should be part of popular culture. A full list of Ince and Cox’s U.S. tour is available on The Infinite Monkey Cage website. The A.V. Club: What do you really love about Carl Sagan? Robin Ince: I would also say that he didn’t have a fear of using the poetry of human imagination. He talked about these ideas, and he was prepared to go on flights of fancy—which, within those flights of fancy, would have proper hard science. But even that very idea—I know some people would now consider quite quaint—the idea of the ship of the imagination, this dandelion seed going across the cosmos. I remember that first episode [of Cosmos]—it was the first time I ever had some sense of the magnitude of the universe, as he talked about light years, as he traveled this distance to eventually arrive back on planet Earth. It really did give you that sense that he was trying to express of the tingling inside. We are only at the very start of it, but we have these incredible abilities to question why we are as we are. It was the first big science show that I remember as a kid. In the U.K., we had David Attenborough’s Life On Earth, but that was more wildlife documentaries even though it was dealing with Darwin’s theory of natural selection. [Sagan’s] tremendously persuasive use of language was something else that he had. The influences that he took on, the people whose quotes he manipulated and turned into something that works in a 20th-century context—I think was just what drew you in. He was a kind of siren of science. AVC: There was an article in The Smithsonian about Carl Sagan—in which Sagan says he was so good at explaining science because it took him a long time to figure it out. He wasn’t one of those brilliant people who just understood things immediately. RI: It’s interesting because working a lot with Brian—he has the depth of understanding, which I cannot even comprehend­—what he sees in his mind when he talks about the muons and the gluons and some of the elements of particle physics, and the very first few moments of the Big Bang. But he has the poetry, the love that comes when you have to work hard to understand something. Because that’s one of the problems that we have at the moment, is that things are very, very immediate. You buy things immediately, we can find any music that we want pretty much immediately—and one of the great advantages that we have as a species is that we have the ability for delayed gratification. And that’s something that comes across with Carl Sagan, you see. It takes a long time sometimes to even get the first glimmer of comprehension. And then the reward of just that first little tiny crack of light, where you go, “I’m beginning to understand”—even, “I’m beginning to understand why I don’t really understand this”—there is a certain level of elation at that point. And that’s what I feel he got across: an attack on the idea of dogma and certainty, to embrace our doubts, but to try and come up with the least wrong version of events. AVC: You both talk about the wonder and awe that Carl Sagan inspired, and The Infinite Monkey Cage is inspired by him as well. Is there anything specific that you learned from him? Something where you had that glimmer of understanding? BC: Well, for me, I think one of the most famous sequences in Cosmos is the cosmic calendar sequence, which I know was repeated in the new version of Cosmos. And I thought that was quite a remarkable piece of television because it explains universal timescales. It’s very difficult to get an idea of how long 13.8 billion years is, the age of the universe. And it’s very difficult to get a feel of that—of what 4.5 billion years, the age of the Earth is—which I think is one of the reasons why people get very confused about evolution. If you’re of that kind of mindset, it just seems impossible that you can go from an organism—not even a single-celled organism, but the pre-cellular organisms. To go from that to complex multi-cellular life forms—it seems difficult. One of the reasons is the lengths of time—the sheer geological cosmic timescales—are not appreciated. So I thought the cosmic calendar was a superb piece of exposition. And I remember watching that, and getting this idea, this wonderful idea, that humans appear at one second to midnight on the cosmic clock. I thought that was magnificent. Something that spoke to me at the time was the sense of modesty: Science is a humble pursuit that answers the questions that it can, and the questions that randomly fall into its lap through observation. But [its purpose isn’t] to answer grand questions or to give grand answers about the meaning of life. Sometimes it stumbles across discoveries that lead to grand conclusions. In one of the Monkey Cages in the U.S. that we’re going to record—it’s going to be the one in Los Angeles—we’re going to talk quite a lot about inflationary cosmology and the idea that some time before the Big Bang, [that time] may have allowed for the creation of many more universes beyond the observable universe. That stuff is profound, but it didn’t come from a desire to be profound. I think Sagan very strongly believed and expressed that in Cosmos. I think that’s why he had the dandelion seed—it’s just a very simple, humble pursuit. It’s just looking at nature, trying to understand what you see, and from that, you’re led to this grand arena of ideas that he presented so well. RI: For me, it was the heike crab. BC: Which has subsequently been shown to be erroneous! RI: I know, but that’s part of the joy we get from returning to it! I would agree with the cosmic calendar. I think trying to comprehend what 4.6 billion years means—it’s very hard for the way our brains have evolved to deal with those kinds of numbers. But I love the fact that when you return to it, you actually see the progress of science—for instance, when they talk about the dying out of the dinosaurs. The theories have changed a few times since then. But at that point, we don’t really know why the dinosaurs died out, and then a few years later, there was the idea of something which was the equivalent of the dinosaur age nuclear winter. I remember at one point, Carl Sagan—I don’t think it was in Cosmos, I think it was in Dragons Of Eden—where he talks about the different ideas of why dinosaurs died out. And one of my favorites was always that there was a particular plant that helped dinosaur digestion. And it died out, and all the dinosaurs died from constipation, which I always thought was a lovely idea. But for me, now—and I don’t know if it was at the time, it’s very difficult when you return to something, to remember what really stuck with you when you were 12 years old—is that final episode. That final episode where he muses on all the potential of being a curious, self-conscious creature. And then of course he explored that a great deal in the beautiful work that is Pale Blue Dot. BC: I think he’s ultimately an optimist. He’s optimistic that the human race and human beings can overcome these rather more primitive and destructive instincts. And I think he very strongly believed, as I do, that the way to do that is through reason and through science and through just understanding our place in the universe, and understanding the value of the human race. And I took that—it’s always been with me, and I suspect that that seed, that way of thinking, was planted by Sagan and planted by Cosmos. AVC: What would you want Carl Sagan to explain to you now? RI: He was also, in that book and in other works as well, reminding not to laugh at people for their beliefs. Demon-Haunted World starts with that lovely story where he’s been picked up by a taxi driver who says, “Oh, it’s amazing—you’ve got the same name as that scientist.” And [Sagan] says, “I am that scientist.” Then the guy says, “I’ve got all these questions about science!” And it turns out they’re all questions about Atlantis and UFOs. And [Sagan] says, “The curiosity [the taxi driver’s] mind had!”—but the culture had taken it into this kind of pseudoscience instead. Over here we have Sir Paul Nurse, who’s a Nobel Prize winner and head of the Royal Society, and he was talking again about the importance of engagement, which I think is something that was very important to Carl Sagan—engaging with people. If someone is misusing science for ideological gain, or has merely misunderstood the science and you want to try to explain it them. We need to—well not me, I’m not a scientist, I’m an idiot—but the scientists, people like Brian or Sir Paul Nurse—they need to approach those people who are not quite understanding science or who are deliberately misunderstanding it—and explain. Say, “This is not the current version of events that we believe to be true.” And then [Sir Paul Nurse] went on—he said, “But repeat offenders who refuse to take notice must be crushed and buried.” And something that you do see from Carl Sagan is that he wasn’t just prepared to sit back in the faux-ivory-ensconced world of academia. He was and could be something of a pugilist as well—a fighter for science. BC: I invited Deepak Chopra to buy tickets [to The Infinite Monkey Cage]. So if he does buy some tickets, and comes and sits in the audience, he might learn something. So I’m doing my bit by inviting him! RI: I bet he cheats. I bet he somehow quantum jumps into our audience and misses out going to the box office. He’s got some kind of knack for that. BC: Well, he does tweet to me and tell me how much money he’s got, so I think he can buy tickets for The Infinite Monkey Cage. So you never know! We might do something good. RI: It’s very easy at the moment to be confused about things like quantum mechanics, quantum physics. It’s so against what we might consider to be our common sense, what we might see as the world as we experience it. It’s a fantastic jumping-off point for people to confuse you and then sell you all manner of hokum and snake oil. And there’s a bit of trying to understand when it is proper science, and when it’s merely the deliberate misunderstanding of science being used as a gateway to get your dollars. You know—we watched something recently where somebody was explaining homeopathy. And they said that Albert Einstein came up with an equation, E = mc², but mass doesn’t really take up very much space if you remove all the empty spaces from it. So really you don’t need the m at all, you can just make it E = c². Well you can’t—Einstein was really clever! There was a reason he kept the m in there. If he could have done E = c² even quicker, he would have done. BC: [Laughs.] There are some important mathematical issues—you can’t say something is small, and therefore we’ll remove it. 0 times c² is not c². RI: It’s also like—the bit after the decimal point in pi is quite small, but I’ll just round pi down to 3—then you find out that a lot of your buildings fall down! RI: Well, people don’t believe [in homeopathy], you see. A lot of people don’t realize what we’re actually buying into. I think a lot of people believe it’s some kind of herbal remedy, probably. They don’t know about this German called Samuel Hahnemann and this constant dilution and then the banging of the solution on a leather-bound Bible and then more dilution. They think they’re buying into something else. I think that’s another job that we have on the show—especially for my case, as a non-scientist—it’s to look at the things that have surprised me that I don’t understand. And if I don’t understand that, there’s probably a chance that quite a few other people don’t realize how they’re being misled. BC: It’s also worth saying that [Sagan] had quite a difficult time of it—and at that time, in the ’60s, ’70s, and ’80s, it was not as fashionable as it is now for academics to try to engage the public in any way at all. It was considered to be a waste of time and something that you shouldn’t really do because it took you away from your work. That was recognized in the past—I myself worked for the Royal Society here in Britain, which is the oldest scientific society. Newton was a member of the Royal Society—it goes back well over 350 years. That was founded for just this purpose: It was to promote science. That had faded a little bit. So Sagan got a difficult time of his peers for spending time doing things like Cosmos. And he never really recovered. He lost scientific credibility, completely erroneously, for doing that. Even though he probably did more to pay for future research and future solar system exploration than virtually anybody else, because he convinced the public and the taxpayers that it was a worthwhile thing to do. So I think it’s worth noting that he didn’t have an easy time in the part of his career that was involved with promoting science and making programs like Cosmos. BC: And we often say on Monkey Cage, don’t we, that people should only be eligible to have medical treatments that they believe in. [Both laugh.] That would be a Darwinian answer to the problem! The other thing about Sagan—we were talking earlier about favorite moments in Cosmos—and with regards to what we’ve just said, there’s a great piece about the library of Alexandria, where he makes this polemical point, which is that Hypatia, the librarian, was the last great librarian. She was killed when the barbarians stormed the gates. And Sagan offers an explanation of how it could be that all this knowledge was lost. He says that because there’s no record in ancient Greece of the scientists and the philosophers trying to share their knowledge, trying to spread their knowledge across the public and the people of Greece, then the barbarians arrived at the gates of the library and there was no one there to defend it. Because they’d kept the knowledge to themselves. It’s a brilliant piece of television because it’s using a piece of history to make a very relevant polemical point about something that matters now. And that’s what I always, always try to do in my programs. That comes, as far as I can see, directly from Sagan. RI: Of course it’s interesting, that story about Hypatia—there are people who [say], actually, it’s not very accurate, but even in some ways that’s a good thing. Just because it’s a Carl Sagan book, don’t immediately go, “Oh there we go, I’ve read that, that must be true!” That’s part of the joy of not just taking one text and one version, but exploring ideas as much as possible, asking ourselves why things are written as they are, and why we believe what we believe. BC: Well, we all have our problems with historians. RI: Oh, let’s not start that one again. BC: Look, you say to the historians of science, a group of them, “Let’s all go and meet and discuss these ideas”; then they won’t even agree on which pub to meet in. Never mind the details of the history.